A major El Nino was the dominant climate feature these years. HadSST is generally regarded as the best of the global SST data sets, and so the temperature story here comes from that source, the latest version being HadSST3. 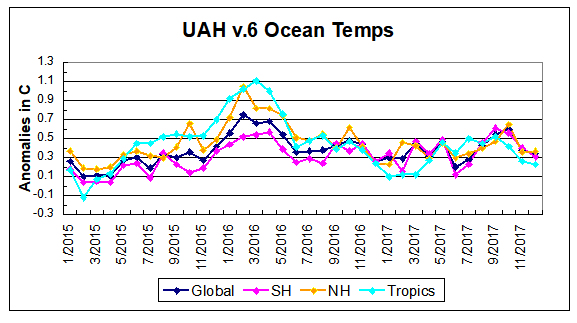 The chart below shows SST monthly anomalies as reported in HadSST3 starting in 2015 through December 2017. After a bump in October the downward temperature trend has strengthened. As will be shown in the analysis below, 0.4C has been the average global anomaly since 1995 and December has now gone lower to 0.325C. NH dropped sharply along with the Tropics. SH held steady erasing the Oct. bump. All parts of the ocean are clearly lower than at any time in the past 3 years. Hi – do you have a link to David Dilley’s papers that you referenced please? Thanks. The CO2 obsession has come at the cost of a lot of well established, evidence backed understanding. I appreciate that you preserve and reintroduce this “missing” knowledge. I came across this today. Can you comment as your studies seem to show the reverse! Graeme, thanks for the question. I am thinking about how to answer concisely while respecting the complexities involved. Stay tuned. I think there is a confusion here. The heat capacities of dry air and of air containing water vapour are very similar*. However, to make warm moist air from cold dry air does require more energy than to make warm dry air from cold dry air, as that energy has to be applied to liquid water (or ice) to evaporate it. That extra energy becomes LATENT heat in the atmosphere, not SENSIBLE heat. When and if the water vapour in the air condenses that heat is released to the surroundings as sensible heat – and a further increase in the temperature of the air then takes place. Of course the matter is complicated by the fact that moistened air is lighter than dry air and tends to rise and cool whereupon the moisture condenses – but this happens because the water vapour is cooled not because the other gases have lost some metaphorical sponge-like qualities. This natural convection process is the real reason for the large transfer of sensible heat, from the sea to the atmosphere, that always shows up in the earth’s heat budget. I do not like phrases such as “colder air holds less water vapour” because they are actually meaningless. The various gases act independently except to the extent that they mix and influence each others’ temperatures. You might just as well say “cold nitrogen holds less oxygen!” This is Dalton’s Law. * If you take a kilogram of dry air in the lab at STP and increase the temperature by 1 K the measured amount of heat you use will be almost the same (just 3% greater) as when you take one kilogram of moist air (97% nitrogen and oxygen and argon, and 3% water vapour) and increase the temperature by 1 K since the heat capacity of water vapour is almost exactly twice that of dry air. I mean that the moist air requires the 3% extra. Energy content is expressed as energy per unit weight of air (Btu/lbair, J/kgair). Air with the same amount of energy may either be drier hotter air (higher sensible heat) or cooler moister air (higher latent heat). The same calculation for moist air at 20C gives a heat capacity of 58.2, so the 5C increase requires 18.7 kj/kg for moist air vs. 5.0 kj/kg for dry air, or a ratio of 1:3.7. Similar ratios apply at all air temperatures above 0C. Subzero air, like that in the Arctic most of the year, shows little difference in heat content between dry or saturated, since cold air doesn’t hold much water vapor. (a) The mass of atmosphere in the troposphere that is involved in a cooling or heating episode in the region is only HALF as great per square kilometer of area as further south – as the tropopause is so much lower. A certain amount of heat will go further therefore in raising temperatures in the lower atmosphere. Your source is indeed talking about making warm moist air from cold dry air, and getting in a muddle. Thermal energy is the same as sensible heat. Internal energy is the same as sensible heat + latent heat. Specific heat capacity (at constant volume) is the amount of sensible heat input required to raise unit mass by unit temperature of a specific substance in a specific form. Your source is calculating the amount of sensible heat that is absorbed while changing both the substance and the form (presumably there is some liquid water around which is imagined to be evaporated into the dry air) ! That is fine so long as he says and understands exactly what he is doing. It is not fine otherwise. It still is a fact that to raise the temperature of a kilogram of already moist (defined as 3% water vapour) air from, say, 310 K to 311 K degree requires only about 3% more heat input than to raise a kilogram of dry air from 310 to 311 K. If one thinks that it takes 270% more heat input, then one is wrong. Thanks Dave for clarifying. Point taken. Somebody has “taken my point” ? Gosh, that has never happened before. Pingback: Weekly Climate and Energy News Roundup #301 | Watts Up With That?